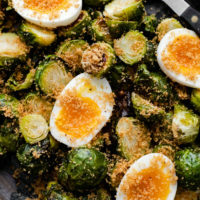 Oven Roasted Brussels Sprouts with Jammy Eggs | Naturally. In the realm of fall cooking, Brussels sprouts are king in my kitchen. We’re constantly eating oven roasted Brussels sprouts as a side or tossing them into grain bowls. They are quick, easy, and delicious. This dish is a slight update on the basic roasted Brussels. 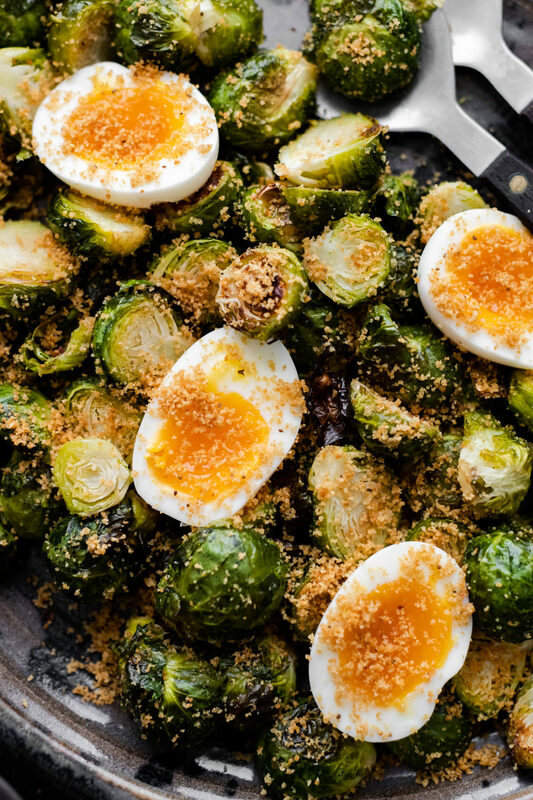 It combines fennel-toasted breadcrumbs and perfect soft-boiled eggs for an impressive side (or lunch, if you’re me)! Over the years, oven roasted Brussels sprouts have made their way onto every holiday table. For me, it all started with my Aunt. Her Brussels sprouts were always perfect in texture and caramelization. Sure, you can use Brussels sprouts raw or even steam them but there’s nothing as magic as oven roasting them. There are recipes that call for blanching the sprouts first. It’s just not needed, especially if slice the Brussels in half before cooking. Simply lather the brassicas up with a bit of olive oil and let them roast, usually a bit past when you would want to pull them out. Also, my favorite part: the crispy leaves. I purposely trim a small bit of the end of each Brussels sprout. This helps a few leaves fall off. During the roasting process, the leaves get extra crispy- think kale chips! I have a weakness for eggs and Brussels sprouts together. That’s partially where this recipe came into creation. I’ve also been a bit in love with these jammy six-minute eggs. The texture of the egg yolk is a bit more firm than that of an over-easy egg which makes it a lovely salad or vegetable topping. 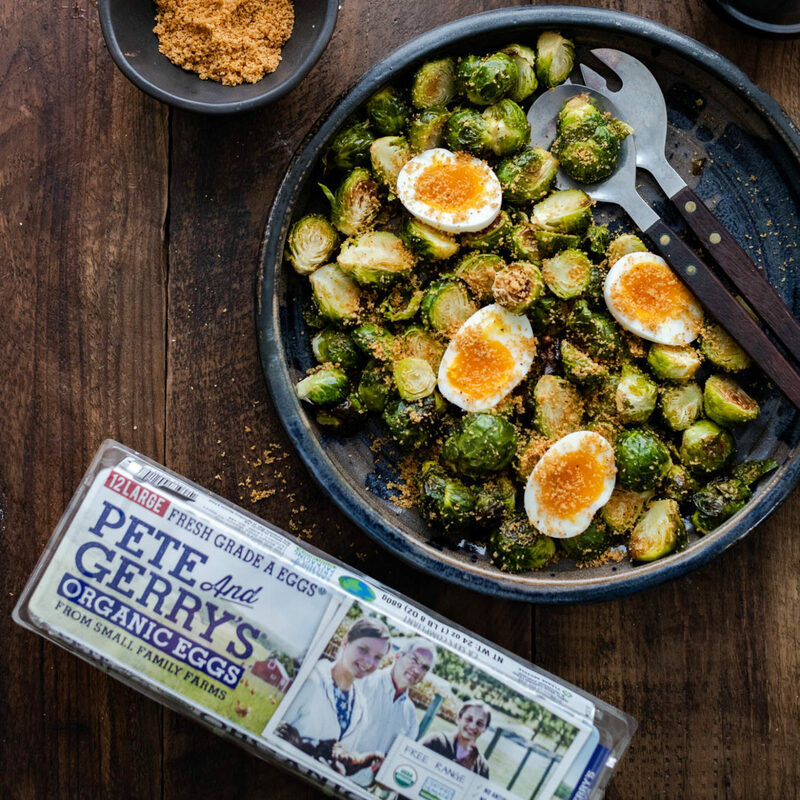 Plus, using Pete and Gerry’s Organic Eggs ensures that my eggs are coming fresh from local, small family farms. These farms take great care of their land and chickens. Plus, it’s a family affair. Since Pete and Gerry’s partners with over 40 small family farms across the country. Their eggs are also Certified Humane Free Range, which means the chickens are actually free to roam. While you could use store-bought breadcrumbs, homemade really shine with these oven roasted Brussels sprouts. This is also a way to use up any leftover bits of bread or those heels that might get left behind. Simply tear or cut the bread into thumb-sized pieces and stick in the oven right before you prep the Brussels sprouts. Bake until they are golden and firm, around 15 to 20 minutes depending on the size of the pieces. Once they cool slightly, whiz them in a food processor or blender until they are crushed. Heat your oven to 425˚F. Slightly trim the ends from the Brussels sprouts and slice in half. Place on a sheet tray and toss with the minced garlic, olive oil, and salt. Place in the oven and roast until tender; 20 to 25 minutes. While the Brussels sprouts are roasting, make the breadcrumbs. Heat a small pan over medium heat. Add the olive oil, followed by the fennel seeds. Toast the seeds for a minute or two, just until fragrant. Stir in the breadcrumbs and continue to cook/toast until the breadcrumbs are golden. Turn off the heat and add in the lemon zest. Next, bring a pot of water to a boil. Add in the eggs and keep at a low boil. Cook the eggs for exactly 6 ½ minutes. Transfer the eggs directly to an bowl filled with ice water and let rest until the Brussels sprouts are done. When the Brussels sprouts are tender, transfer to a serving tray and toss with half the breadcrumbs. Crack, peel, and then slice the eggs in half. 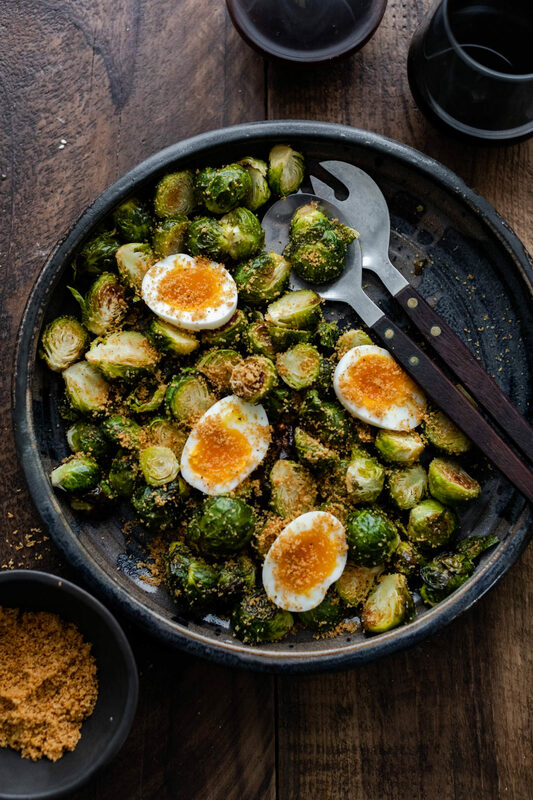 Nestle into the Brussels sprouts and top with more breadcrumbs before serving. Notes: Jammy soft-boiled egg recipe is from Bon Appetit. Sounds delicious! I have a couple of questions: when you mentioned loosening the leaves of the Brussels Sprouts, do you trim the stem off to make the leaves looser? Also, is there any type of bread you recommend for making the crumbs? The bread I have on hand is very dense and grainy. Thank you!